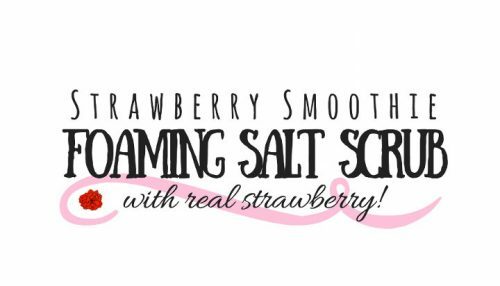 Dish up some fun in the kitchen with this amazing strawberry smoothie salt scrub recipe! It’s exfoliating and toning skin care properties will help keep your skin ready to show off all season long! Keep reading to learn how to make this easy spring inspired strawberry smoothie foaming salt scrub recipe! I created this foaming salt scrub recipe with real strawberry fruit powder for it’s skin soothing properties. Strawberry fruit powder is rich in polyphenols and Vitamin C and has toning properties when used in skincare products. In addition, I used dendritic salt in lieu of regular salt. Dendritic salt has a finer grain and larger surface area than other salts which offers greater fragrance retention in cosmetic applications. It also dissolves faster in water. In a separate container weigh out the salt and strawberry fruit powder. Then, using a measuring spoon, measure out the mica powder. 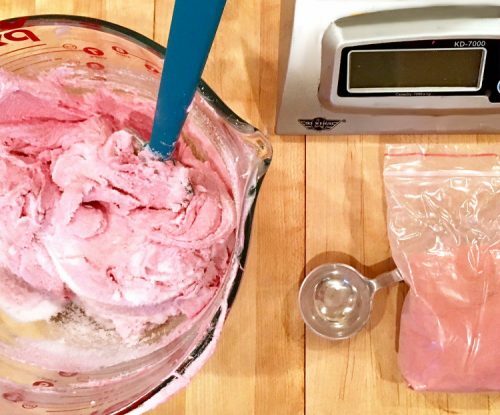 Mix the mica, strawberry powder and salt together then pour into the scented foaming bath whip base, mixing with a spatula as you go. 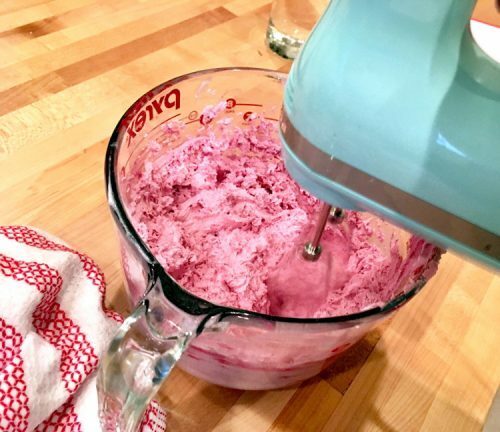 Once the dry ingredients are incorporated into the scented foaming bath whip base, mix well with a hand mixer on high speed for 3-5 minutes. Now spoon or pipe the strawberry smoothie foaming salt scrub into your containers of choice. I used 9 oz. clear straight sided glass jars with silver metal lug caps from from SKS Bottle & Packaging. This product will yield around 22 oz. (624 grams) of product by volume. So I was able to fill two 9 oz. and one 4 oz. glass jars. To use, simply remove desired amount and massage onto damp skin in the shower to cleanse, tone and exfoliate, then rinse off. 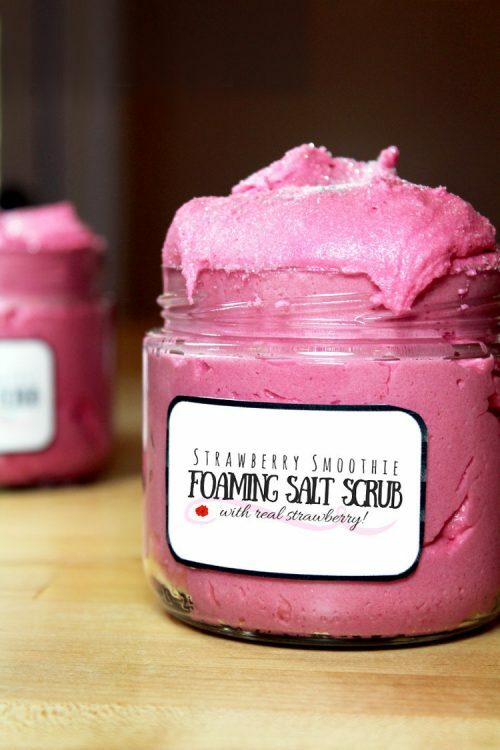 My strawberry smoothie foaming salt scrub recipe is best suited for normal to oily skin. It is important to note that fine salt crystals will dissolve in this base over time. Therefore I recommend using larger salt crystals than the dendritic salt if you aren’t using this product right away. You can also substitute the salt with sugar. In addition, I advise using an additional preservative if you’re planning to sell or store your strawberry smoothie foaming salt scrub prior to use for an extended amount of time. If selling your homemade products, you’ll need to follow FDA guidelines for labeling your product. Not sure how to label your creations? I highly recommend the book, Soap and Cosmetic Labeling: How to Follow the Rules and Regs Explained in Plain English, by Marie Gale. Like the idea of strawberries but don’t want a strawberry scent? This foaming salt scrub recipe is also nice with a pink lemonade flavor oil! For more recipes like my strawberry smoothie foaming salt scrub recipe, be sure to check out my DIY Bath and Body board on Pinterest. You can also find and follow me on G+, Tumblr, Facebook, Twitter, Blog Lovin’, and Instagram. Or sign up to receive new posts from Soap Deli News blog to your email via FeedBurner so you never miss a post. You can find my salt scrub recipes here. The others I only have a few of but there are Whipped Body Butter Soufflé & Exfoliating Whipped Sugar Scrub Recipes here or you can search for what you’re looking for using the search feature. Looks and sounds soooo good!! Would love to try!! If I don’t use the strawberry fruit powder (changing a few things) and use something non perishable- do I really need the preservative? The foaming bath whip base I used already has a preservative in it, so it would be optional unless you want to add more to be on the safe side. However, if you choose a base without a preservative, you would need to add one. What type of base are you planning to use? 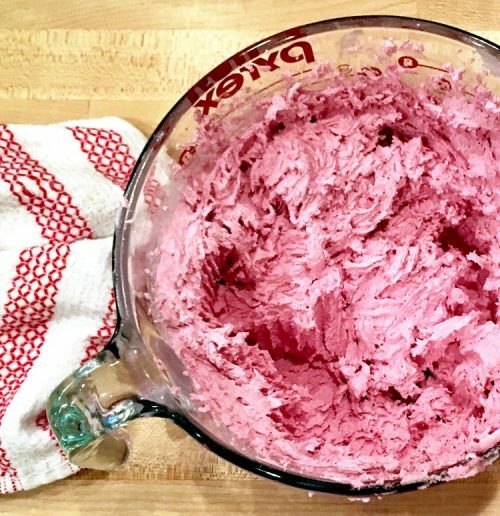 You really do need a foaming bath whip base or foaming bath butter for this particular recipe. These typically contain water and already have a preservative in them. Is there a shelf life for this? If so how long will it last if not used daily? The foaming bath butter base has a preservative. You don’t necessarily need to add an additional one, but it is a preference often times for someone selling bath and beauty products that can come in contact with water to be safe. Your shelf life is always the same as the ingredient with the shortest shelf life. Was it the same base or a different one? It may be that it’s cold and needs to be brought to room temperature. It is a semi-solid product so it’ll be stiff but it shouldn’t be rock hard. You shouldn’t need to melt it down. Once you add the additional ingredients and start mixing it, it should be fine.